Conventional batteries store electricity by changing the chemistry of their internal chemical compounds. During discharge, the chemistry is reversed and electrons leave the battery to power an attached load. The chemical reactions that convert electrical energy to and from chemical energy take time, therefore are slower to charge and discharge. This is the reason why you can’t charge your iPhone very fast. In technical terms, batteries exhibit low power density and high energy density. Unlike batteries, supercapacitors store charge in sub-nanoscale crevices through electric fields that naturally form inside its structure. During discharge, electrons rapidly leave through the terminal without having to undergo slow chemical reactions. In theory you could charge your iPhone in a few seconds if it had a supercapacitor instead of a battery. However, the challenge for supercapacitors is that while they can be charged and discharged rapidly, they do not store as much energy as batteries. Therefore, using a supercapacitor to power your iPhone would make it too big and too expensive. In technical terms, supercapacitors exhibit high power density and lower energy density. Since solar energy is only available during the day and naturally sporadic because of weather and clouds, a large capacity and fast charge-discharge energy storage system is needed to quickly store the energy of the sun so that it can be used anytime – day or night. BioSolar believes that such a solar energy storage system can be built by combining a supercapacitor frontend with a battery backend. This game-changing solution will allow users of solar energy systems to time-shift solar energy to reduce their dependence on, or go completely off, the electric utility power grid. The key is a low cost and high capacity supercapacitor. BioSolar’s BioSuperCap can be such a device. BioSuperCap Inspired by nature, BioSolar is developing BioSuperCap, a patent-pending low cost polymer-based supercapacitor that can be charged and discharged hundreds of times faster than batteries and will hold more energy than conventional supercapacitors. Unlike conventional supercapacitors made from expensive materials such as activated carbon electrodes, solvents and organic electrolytes, BioSuperCap is made from a very inexpensive conductive polymer electrode, with novel and inexpensive electrolytes. Additionally, BioSuperCap materials are non-flammable, non-explosive and environmentally friendly, making it a safer device than conventional supercapacitors in more applications. The BioSuperCap laboratory prototype has demonstrated stable performance at high energy density with very high cycle life (i.e. high number of charge-discharge cycles). Our current development is focused on: (1) maximizing the energy storage time, (2) maximizing energy density, and (3) manufacturing processes. Our preliminary materials cost analysis suggest that our high energy density BioSuperCap will cost 65% to 75% less than conventional supercapacitors. Intellectual Property BioSolar co-owns the patent-application for this supercapacitor technology with the University of California at Santa Barbara, and is currently funding a sponsored research program to further its development. The lead inventors of the technology are UCSB professor Dr. Alan Heeger, the recipient of a Nobel Prize in 2000 for the discovery and development of conductive polymers, and Dr. David Vonlanthen, a post-doctoral researcher at UCSB. Electrical loads on consumer electronics such as cell phones, portable GPS devices and electric screwdrivers are always fluctuating, depending on usage. 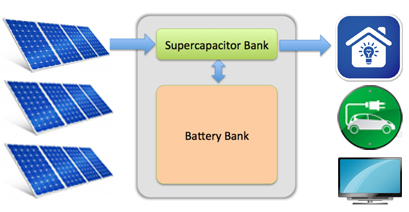 Supercapacitors are ideally suited to stabilize the power supply. For example, supercapacitors can deliver a brighter camera flash than batteries, or charge a portable screwdriver in a minute. Supercapacitors can be used in regenerative braking mechanisms to store the electricity generated from braking, to recharge an onboard battery bank for extended range and better fuel efficiency. The high power feature of a supercapacitor is ideally suited for military applications such as radar antennae, laser power supplies, military radio communications, avionics displays and instrumentation, backup power for airbag deployment and GPS-guided missiles and projectiles. The quick charge feature of a supercapacitor makes it possible to eliminate the overhead power lines used by light-rails and trams, by enabling quick charge in schedule stops instead of along the route. This preserves historical architectural heritage and visual appeal. This application of supercapacitors is already demonstrated in various places throughout the world such as Manhattan, Paris, Hong Kong, and China. BioSolar’s vision of a high power and high energy solar energy storage system is essentially a microgrid design, and a smart-grid design when connected to the utility power grid. Supercapacitors have features that are unmatched by batteries and are critical to the future of distributed renewable power generation. Homes, office buildings, and campuses, can have their own microgrids for localized energy independence. When these microgrids are connected to the power grid, they can be enhanced to become smart-grid nodes to help smooth out the supply and demand of electricity for all constituents on the grid. A tremendous amount of electricity is wasted in today’s “use it or loose it” model – whether it’s from coal, natural gas, solar, wind, or hydro. Efficient, high power and high capacity energy storage systems can turn electricity into a “use it now or use it later” model. The key to such a vision is a low cost, high capacity supercapacitor.BioSolar helps to realize this vision with BioSuperCap.